This is a great recipe for the summer, it is a simple and easy traditional Portuguese crab salad recipe, known as Salada de Caranguejo. It resembles a Portuguese tuna salad but with some delicious crab meat and some good quality mayonnaise it really makes this recipe stand out. This is a great appetizer for summer barbeques or even as a light lunch. Mix the crab, eggs, and parsley in a bowl, add a little salt and toss. Take a separate bowl and mix the mayonnaise, cream, mustard, Port wine, cayenne and black pepper until the are all combined well. 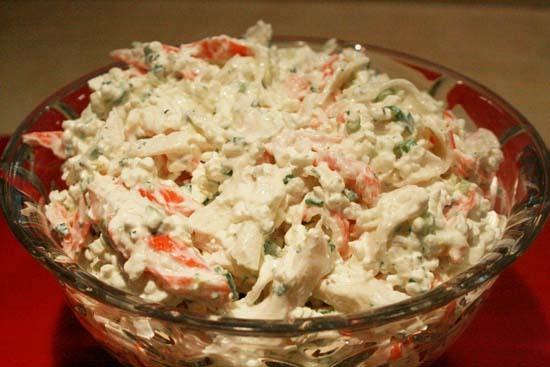 Pour the mayonnaise mixture into the bowl with the crab and gently mix the ingredients. Ways to serve: Inside of cleaned crab shells, on a bed of fresh lettuce or simply spoon it on to a small appetizer plate. Grind black pepper on top and add a little finely chopped parsley before serving.